Water, Wind, Earth & Fire: The Christian Practice of Praying with the Elements ReviewIt doesn't take a rocket scientist to figure out that St. Francis of Assisi's "Canticle of the Creatures" (also known as the "Canticle of the Sun") is a powerful and poetic evocation of God's presence in the elements of nature. But few Christians, in my experience, seem to draw the connection that if the elements are indeed agents of God's blessings and means by which we can offer blessing and worship back to God, then it might make sense to think in terms of "air prayer," "water prayer," and so forth. This is the simple yet powerful premise of this lovely new book from Christine Valter Paintner, a Benedictine Oblate and the founder of the Abbey of the Arts website which explores the connection between spirituality and creativity. Some readers may wonder if this is a crypto-Wiccan book, and indeed anyone interested in creative cross-fertilization between Neopaganism and Christian spirituality will find much to explore in this book. But let's be clear: the four elements (air, fire, water and earth) are universal energies, since they are grounded not only in the nature of the earth, but indeed in our very bodies (think of it: your skeleton and flesh are earth, your blood is water, your lungs and breath bring you air, and the very heat your body generates is the fire within you). Historically speaking, knowledge of the four elements and exploration of their spiritual meaning can be traced back to Greece, where Plato speaks of the elements, following the earlier Sicilian philosopher Empedocles. In other words, our earliest knowledge of the elements is not occult or magical, but rather philosophical and scientific, in scope. For Christians today, befriending the four elements is a way to honor the incarnational dimension of our faith, seeing God's presence in nature just as we believe the Holy Spirit and the Mind of Christ is present among those who are knit into the community of faith. This book is essentially a workbook ("playbook"?) for prayer, divided into sections where Valters Paintner explores each element through poetry, stories, blessings, quotations, lectio divina, and suggestions for prayer and reflection. Most of the connections she highlights are obvious enough: water is linked to baptism, air to centering prayer, earth to feasting. This is not a book of secrets revealed so much as earthy common sense: water goes with the flow, fire brings passion and creativity, earth stabilizes and grounds us. Weave all four elements together and we find balance, perspective, and a sense of being at home in the good universe God has given us. 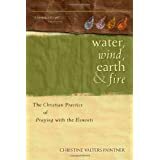 Want to learn more information about Water, Wind, Earth & Fire: The Christian Practice of Praying with the Elements?